My grandfather was a endless source of old tales, traditions and sayings. One particular favourite of his that has stuck with me: "If you are rich, you're eccentric and if you're poor, you're crazy." This was the first thing that popped into my head when i read about Sarah Winchester, the woman behind the Winchester Mystery House. 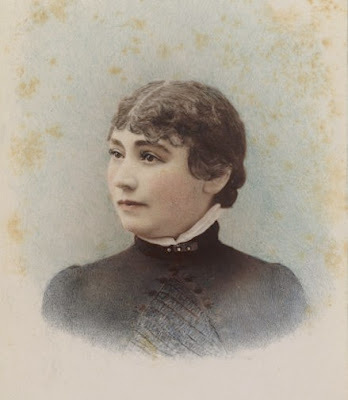 Sarah was married to William Wirt Winchester, treasurer of the Winchester Repeating Arms Company . The Winchester Company was a prominent firearms company in the late 19th century and manufactured rifles that were sturdier and less likely to jam. These became known as the "Gun That Won the West." In 1866, Sarah gave birth to their only child Annie but the infant died six weeks later. 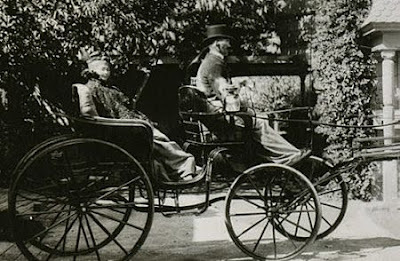 William died of tuberculosis in 1881. Losing the two most important people in her life plunged Sarah into a deep depression and driven by grief, she consulted a medium. The "Boston Medium" told Sarah that she believed the Winchester family were cursed because the rifles they manufactured has claimed so many lives and that the spirits of thousands of American Indians, Civil War soldiers and others were seeking vengeance. 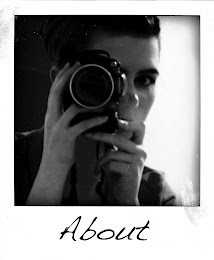 There are a few different versions of events which supposedly explain her next bold move. One is that the medium told Winchester that she had to leave her home in Connecticut and travel west where she must "build a home for yourself and for the spirits who have fallen from this terrible weapon, too. You must never stop building the house. If you continue building, you will live forever. But if you stop, then you will die." Another is that during a seance she received a communication from her dead husband; in which he said "Sarah dear, if our house had not been finished, I would still be with you. I urge you now to build a home, but never let it be finished, for then you will live." At this point i should mention that Winchester inherited more than $20.5 million upon her husband's death. She also received shares in stock totaling nearly 50 percent ownership of the company. Factor in that income wasn't taxable until 1913 meaning she had approximately $1,000 a day (equivalent to $22,000 a day in 2010) at her disposal. Sarah packed her bags and left Connecticut to visit a niece who lived in Menlo Park, California. 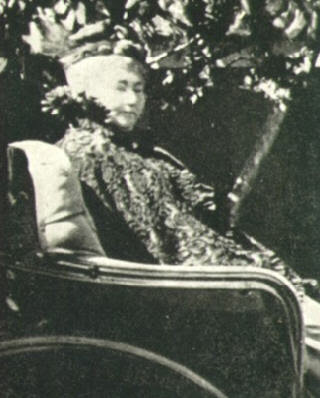 Whilst visiting the Santa Clara Valley in 1884 she discovered the perfect land on which to build her house. She purchased an unfinished farm house and immediately hired carpenters to work in shifts 24 hours a day. By the turn of the century the eight-room house had developed into a seven-story mansion on 161 acres of farmland and featured exquisite gardens with plants imported from across the globe. According to legend, Winchester held a nightly seance to assist and guide regarding her building plans and for protection from bad spirits. In the morning, she would meet with the foreman John Hansen to go over new changes and additions. During the early years of construction, this resulted in some strange concepts such as columns being installed upside down and resulted in many features being dismantled, built around, or sealed over. Construction continued 24 hours a day and it is estimated that approximately 500 rooms were built but because so many were redone only 160 remain. 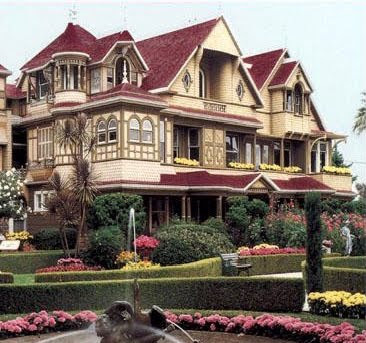 The 1906 San Francisco earthquake severely damaged the house. 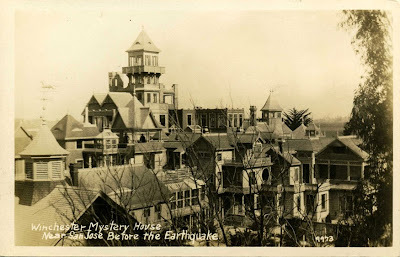 Apparently Winchester felt the earthquake was a warning from the spirits that she had spent too much time and money on the front section of the house, which was nearing completion. After having the structural damage repaired, she ordered the front thirty rooms to be sealed. 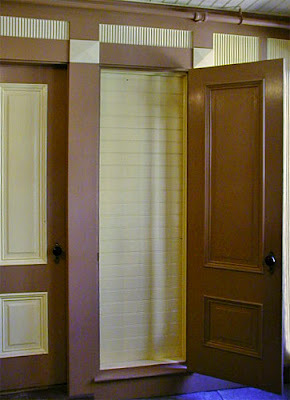 The heavy, ornate front doors which had been installed just prior to the earthquake had only been used by three people – Mrs. Winchester and the two carpenters who installed them. No expense was spared throughout the 38 years of constant construction on the house and grounds. 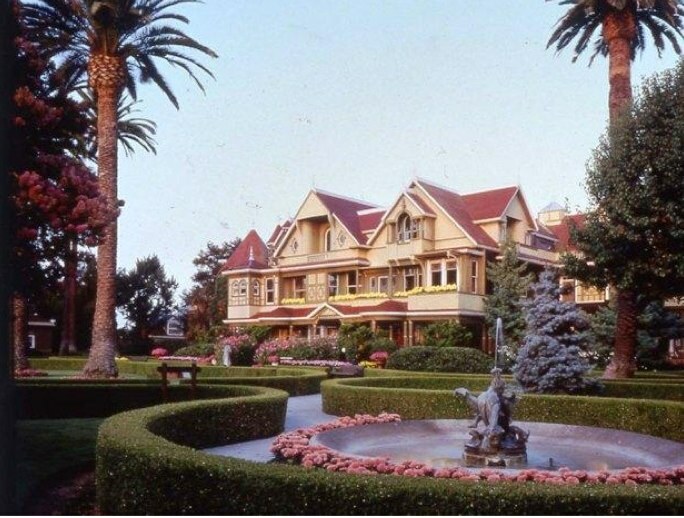 Gold and silver plated chandeliers, imported Tiffany art glass windows, German silver and bronze inlaid doors, Swiss molded bathtubs, precious woods like mahogany and rosewood and other items were docked onto a side track at San Jose. Everything was then transported to the house where it was stored and much of the material was never utilised. At the time of Winchester’s death in 1922, there were rooms full of ornate treasures still waiting to be utilized. 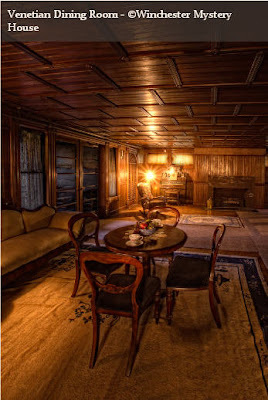 One of the most striking features of the house are the parquet floors, which were crafted from mahogany, rosewood, teak, maple, oak and white ash. One master craftsman specifically focused on building, installing, tearing up and reinstalling the floors. The house displays breathtaking craftsmanship- The Grand Ballroom was built at a cost of over $9,000 at a time where an entire house could be constructed for well under $1,000. 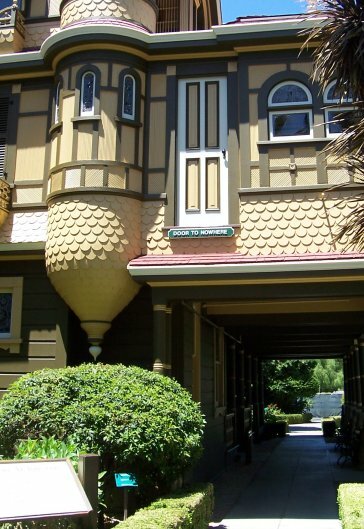 It was built almost entirely without nails, instead using joinery to piece the ornate woodwork together. The silver chandelier came from Germany and the walls and parquet floor are made of six hardwoods. One element of the Grand Ballroom which remains a mystery to this day is the inscription on two of the leaded stained glass windows. 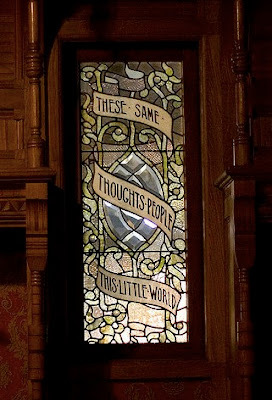 Both are quotes from Shakespeare: "Wide unclasp the table of their thoughts" is from 'Troilus & Cressida' and "These same thoughts people this little world" is from Richard II. 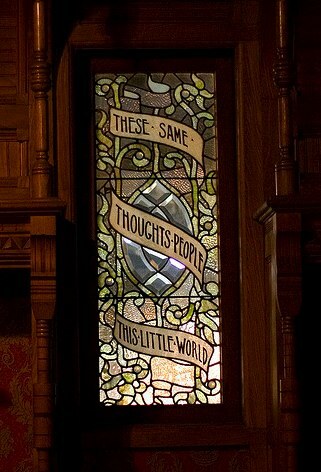 It is uncertain as to what these lines meant to Sarah or why they are incorporated into the stained glass. The house also has a number of strange features such as doors that open onto walls, stairs that lead to the ceiling and chimneys that stop just short of the roof. The Switchback Staircase has seven flights with forty four steps, rises only about nine feet as each step is just two inches high. 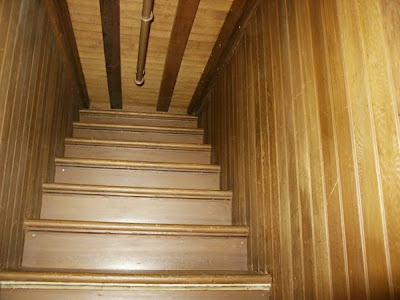 The miles of hallways also had secret passageways in the walls built so that Winchester could travel through her house in a roundabout fashion, supposedly to confuse any mischievous ghosts that might be following her. There was also a door placed on an external wall- 'The door to nowhere'- and if one was to use it as an exit, there lies a 12 foot drop onto the ground below. Again it is not know why she ordered features likes this to be built into the house. Winchester was a mysterious women-supportive of the community but she generally kept to herself. She was also fixated on the number 13 and cobwebs. 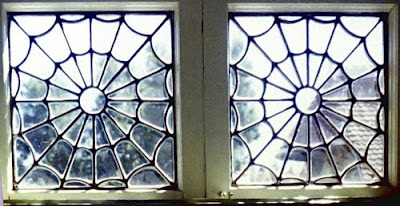 Both can be observed in motifs throughout the house. 13 rails by the floor-level skylight in the South Conservatory, 13 steps on many of the stairways, 13 squares on each side of the Otis electric elevator, 13 holes in the sink drain covers, 13 ceiling panels in some of the rooms and 13 gas jets on the Ballroom chandelier. When she died her will had been written in 13 sections and was signed 13 times. Sarah died in 1922 at the age of 83 and for the first time in 38 years, construction came to a halt. She left the contents of the mansion to her niece, who gathered what she wanted and auctioned the rest. It apparently took movers six and a half weeks to empty the entire house of furniture, filling eight truckloads a day for that period. The mansion was then sold to a local investor who opened the house to the public for tours. It is said to contain numerous spirits and remains a popular tourist attraction. The exact reasons as to why Sarah built the house and the meaning behind the unique features contained within were lost when she breathed her last breath.